You can print any of Juristat's Reports. However, because printing reports or saving them as PDFs removes the interactive functionality of our reports, we recommend giving additional people at your organization access to your Juristat subscription or sending your colleagues a link to the report you're viewing as an alternative. Additional users can then log in and view reports and take advantage of all the interactive filters and features. Use the "Print This Report" button on the upper right corner of the report. You can also use this button to save a PDF of any report using your printer's settings. Printing Juristat Search results is as easy as clicking "File" and "Print" on your browser. You can print results either in card (more information) or table (more compact) format. Note that each page of search results prints separately. 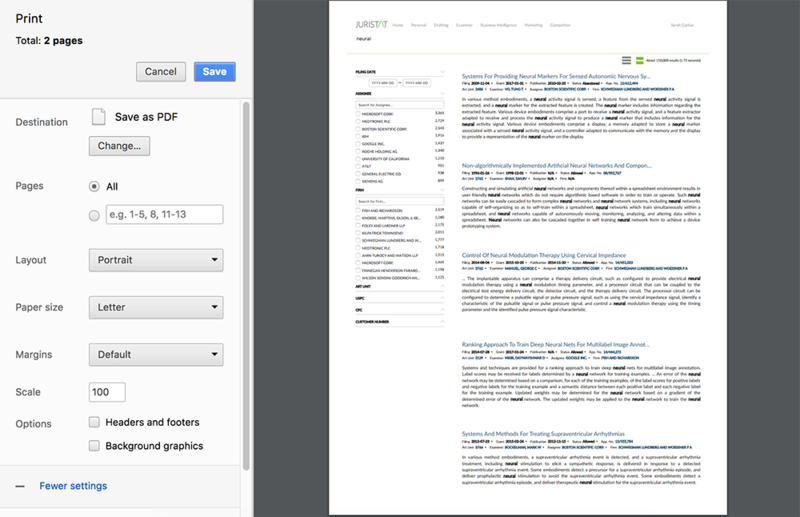 For example, clicking "print" while viewing the first page of results will print only the first page. If graphs are cut off or not printing properly, try checking your printer's settings. If your printer is using the 100% scale option, try changing it to decrease the scale or you may have a "shrink to fit" or "shrink to scale" option. If that occurs you have a couple of options: 1) try a different printer or browser, or 2) instead of printing directly, select to "save as PDF" and try printing the PDF. Related Articles: Can I export data from Juristat reports? Still have questions? Just ask us or head back to our Help Center.